In Japanese folklore, animals play an important role in the origin of earthquakes. According to a popular story, the cause of earthquakes is the giant catfish Namazu. Hiding somewhere beneath the Japanese mainland, sometimes he wiggles his tail, causing an earthquake in the human world. Some researchers believe that the myth of Namazu is based on people noting unusual behavior of catfish before an earthquake. However, folklorists noted that the history behind the myth is much more complicated. Namazu is considered one of the yo-kai, creatures of mythology and folklore causing misfortune and disasters. 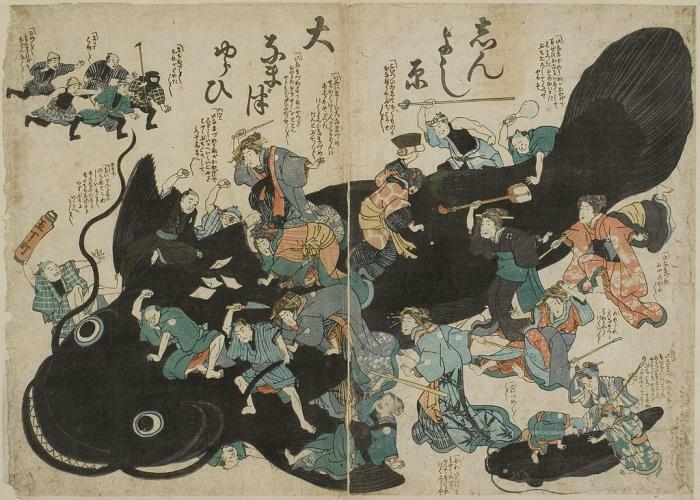 Namazu depictions are known since the fifteenth century, however, only in the late eighteenth century the catfish became associated with natural disasters. In the Tokugawa period (1603-1868) the catfish was a river deity associated with floods or heavy rainfall. Namazu often warns people from an imminent catastrophe or swallows dangerous water-dragons, preventing further disasters. Over time the catfish gradually replaces other animals, like water-dragons, the giant eel Jinshin-Uwo or the dragon-beetle Jinshin-Mushi, as earthshaking yo-kai. The history of such myths explains also in part why some animals, especially fish, still today are regarded as a harbinger of disasters in Japan. The giant oarfish, a deep-water creature living at depths from 650 to 3,300 feet, is the longest bony fish in the world, with 13 feet upwards, presumed to be responsible for some sea serpent sightings by European sailors. In Japan, it is believed to be sent by the dragon-king of the sea to warn people along the coast of an impending earthquake or tsunami. Earlier this week a 10.5-feet specimen washed up on the shore of Toyama Bay on the Sea of Japan, while a 13-feet specimen was caught in a fishing net off the nearby port of Imizu, bringing the total oarfish found this season to seven. At least a dozen oarfish had washed up onto Japan's coastline in the year prior the 2011 Fukushima earthquake and subsequent tsunami, sparking articles about the supposed connection between sightings and earthquakes. In July 2015 a live oarfish was caught near Santa Catalina Island off the southern California coast. It was the third oarfish spotted in 19 months in the waters surrounding the island or washed ashore. Already in 2014, one specimen was washed ashore along the Santa Monica coastline and in 2013 in just a week two specimens were found dead on the shores of Santa Catalina Island. 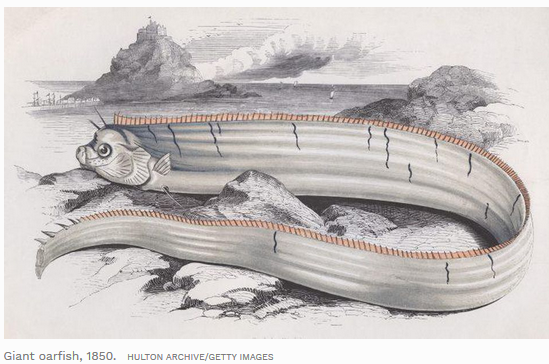 Some media searched for a connection between oarfish sightings and earthquake activity along the San Andreas fault, but none was found. Biologists have proposed various explanations why oarfish periodically are spotted at the surface of the sea or found dead along the shores. They are not the greatest swimmers, and seasonal currents could push them to the surface, where they eventually die from exhaustion. A more exotic (and not proven) explanation involves gases or chemical compounds released by underwater fissures, poisoning and killing the animals in the sea. There is no statistically significant link between the behavior of animals and seismic activity to be found and there is to date no increased seismic activity in the oceans surrounding Japan reported. I'm a freelance geologist working mostly in the Eastern Alps. I graduated in 2007 with a project studying how permafrost, that´s frozen soil, is reacting to the more visible recent changes of the alpine environment. Studying therefore old maps, photographs and reports, I became interested in the history of geology and how early geologists figured out how earth works, blogging about it in my spare time. Living in one of the classic areas of early geological research, I combine field trips with the historic maps, figures and research done there. But geology is more than a historic or local science, as geological forces shaped and still influence history worldwide.